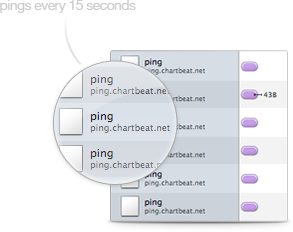 What is ping.chartbeat.net and why do I see it in my browser footer? When you see ping.chartbeat.net in your browser footer it's because the site you are on is running chartbeat real-time analytics. Chartbeat is used by the owners of this site to help them understand what's happening on their site. The data it sends is anonymous and the site owners don't see any Personally Identifiable Information as a result of this. It's more like "someone from New York City is on the gardening page of your site". See an example of a chartbeat dashboard. Does this slow down the site? No. We get it, it's frustrating to see this site waiting on this ping.chartbeat.net thing. Unfortunately, the browser is blaming ping.chartbeat.net unfairly; it's really not slowing down the site at all! A bug in some browsers means that whenever they are waiting on a part of the site to load they don't reference the slow-loading item but instead reference the code at the bottom of the page. So, when the browser tells you it's "waiting for ping.chartbeat.net", what it actually means is it's "waiting for this image or advertisement to load so that I can get down to ping.chartbeat.net and finish the job". You can find more information about this browser bug, and please don't hesitate to reach out to support@chartbeat.com if you need any more information or if we can help in any way.